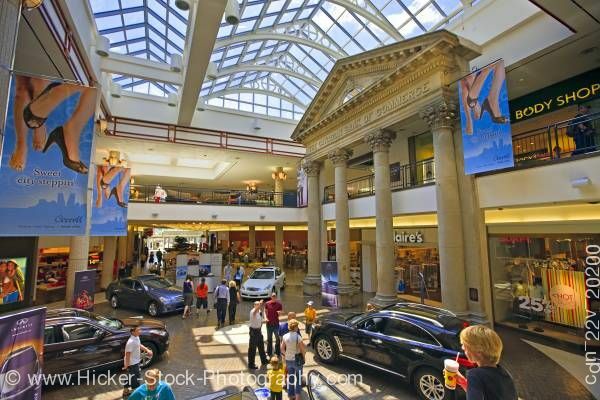 Stock photo of a shopping day at the mall with several people walking to shops at the Cornwall Centre, City of Regina, Saskatchewan, Canada. People shopping at the mall at the Cornwall Centre, City of Regina, Saskatchewan, Canada. This stock photo shows a shopping day at the mall with several people walking to shops at the Cornwall Centre, in the City of Regina, Saskatchewan, Canada. facade of the old Canadian Imperial Bank of Commerce building in front of the stores. The facade shows 4 ornate columns below a detailed peaked front. Among the shoppers are 4 vehicles on display. The mall is two story with a glass paneled ceiling. The walls are white and the top floor wall has a red grid design around it. Each store has a large glass window for displaying their merchandise. Blue banners hang from the second floor. Around the second floor are wrought iron railings. Facade of the old Canadian Imperial Bank of Commerce building in the Cornwall Centre, shopping mall in the City of Regina, Saskatchewan, Canada.